GlowBall Technology – adds an extra dimension, in the dark! The backboard, rim, and seven Shot Spots use Live Wire to glow. Special EZ Shot basketballs glow too, and come in three sizes. Comprehensive Training – All skills are important, but shooting makes the points that win the games. EZ Shot’s patented technology delivers more than 1,800 balls per hour – an intensive workout that develops all your skills together. A variety of challenging drills are pre-programed in the on-board computer. Additional patterns include the 25 shot athletic drill, and the 50 shot Iron Man Catch, Shoot and Score Competition. This drill is designed to keep the shooter focused with balls being shot every 3 seconds. Shooting combined with a small amount of movement is required with this drill. You better be ready to shoot and move with this one! EZ Shot is an excellent tool for special training and recreation, as well as assisting players during rehabilitation. EZ Shot improves fundamental timing, movement and shooting skills through skill development and extensive repetition. Players must catch the pass at a designated Shot Spot, quickly get into shooting form, release the shot and move to the next designated Shot Spot. EZ Shot helps develop and perfect quick feet, soft hands, a faster release time, as well as accuracy. Three different sized nets – Adult, Junior and Pee Wee, address the needs of males and females, from approximately age 7 to adult. 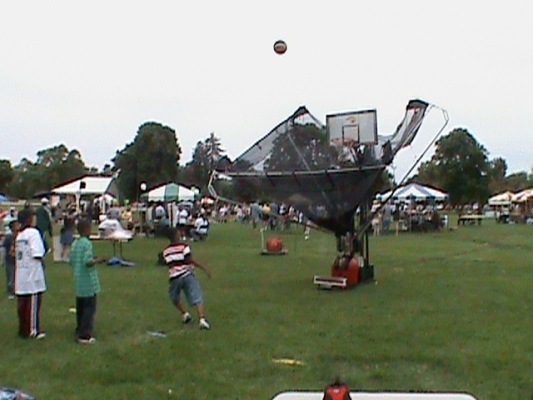 In addition to variable backboard height – 10, 9 and 8 feet – the speed and trajectory of the ball passes can quickly be adjusted from approximately ten feet to the NBA Three-Point line.